A mini-activation includes one written page of light codes accompanied by an MP3 audio of light language given specifically for you . This audio-visual experience will activate a higher level of awareness, remove blockages, and help shift limiting beliefs and mental patterns into a new paradigm of self-empowerment. During a mini-activation, Yvonne connects with her beloved guides and your higher self to create a resonate field. Holding space in higher dimensions, she transmits frequencies that help you align with your authentic expression of Source love. 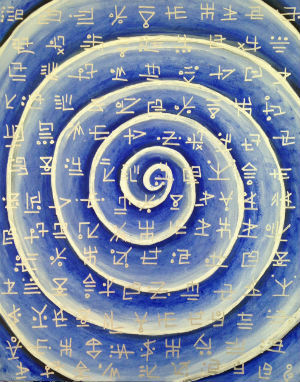 These activations contain the information that your guides wish to reveal at this time; they are not psychic readings. They contain frequencies, tones, pulses, light, and colors that instruct the proper realignment of the thoughts, emotions, and DNA of the body. Any English words that come forth are to be interpreted by the client. The purpose is to help you trust your intuition and inner guidance. We use light language and galactic codes to move beyond the mind to reach the heart, soul, and body at an atomic level. This opens more strands of DNA, brings closure to outstanding issues, and releases trauma from the cells of the body. The English words do have relevance, and when you seek your inner guidance for further insight, you will likely get a deeper understanding. This method creates an internal dialog and opens communication between you and your guides, which makes you less dependent upon another person for answers and more able to discover your own truth. What do the symbols mean? These symbols provide a visual record of the codes that are transmitted during the activation. Focusing on them can provide a connection with your higher self and help you more receive more information. As these codes are activated, your soul receives messages on a quantum level, making your guidance clearer. Does each symbol have a meaning? Yes, and no. It is not like the English language where each symbol is a letter or word. Each symbol is like shorthand and some may contain as much information as a book. You can gain insight from one symbol or from the big picture. Some are like mapping coordinates that locate blockages in the body or in the cosmos that apply to you. If you like to have regular energy tune-ups, the package of six 15-minute recordings might interest you.